Alright nerds, now’s not the time to be shy. How much did you love Battlestar Gallactica? How much did you love Edward James Olmos as Admiral Adama? Even further, how much did you love Adama’s command during intense space battles and Faster Than Light jumps? If you answered “pfhh, a mega crap ton” to even one of these questions, I suggest you scrounge up 10 bucks and score a copy of FTL: Faster Than Light. You can do so on Steam, GOG.com and the game’s official site. This game started as a Kickstarter project. The Subset Games team, which consists only of Justin Ma and Matthew Davis, asked for $10,000 in order to fund the creation of this rogue-like space combat and exploration simulator. They met that goal easily. In fact, when the funding period closed for this project, Ma and Davis had more than $200,000 at their disposal. That bucket of scratch came from a little more than 9,000 backers. That was on April 1st of this year. Flash forward to September 14th, and the game released. Don’t call this a review. It’s not. 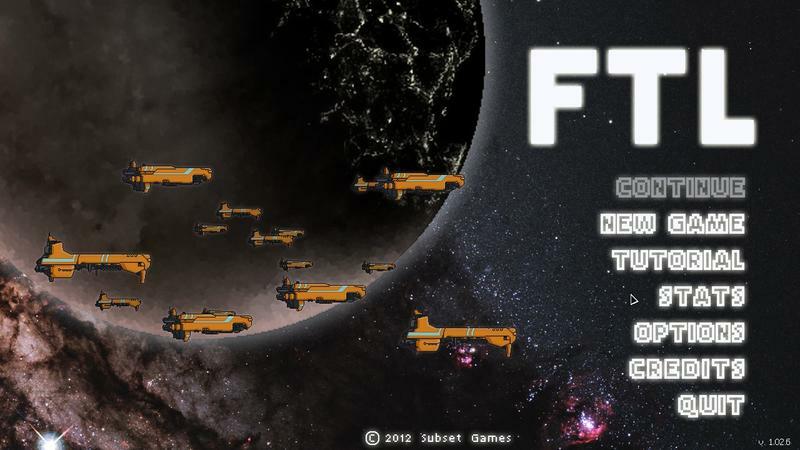 FTL: Faster Than Light has been out for a while now. Thanks to the holiday rush of games, I’m only now having a chance to settle into the game. I’ve known about it since its beginnings, but playing it had to wait. This is a PC and Mac only experience. Now that I’ve had a chance to sit down with the title, I can say that I’m incredibly into it. It’s one of the most addictive games I’ve played in a good long while. Essentially, you’ll be tasked to bring one ship across a hostile galaxy in order to deliver information. That’s accomplished by charging your FTL drive and jumping from point to point to point. Along the way, you’ll be hit by hostiles, asked to help civilians and chased by bad guys. You manage your ship from a top-down perspective. From this vantage point, you can see the craft’s hull, its individual rooms and the crew manning each station. Your ship has separate systems that control things like doors, oxygen, drones, shield, engines and piloting. You’ll need to distribute power to each system in order to traverse the galaxy and engage in combat with enemies. Basically, this is a point-and-click management game. The whole time you’re playing, you’ll constantly need to distribute crew members, energy and orders. The pacing can be rather frantic, especially when the enemy boards your ship and holes start opening up in your hull. Oh, and did I mention that this thing is brutally difficult? 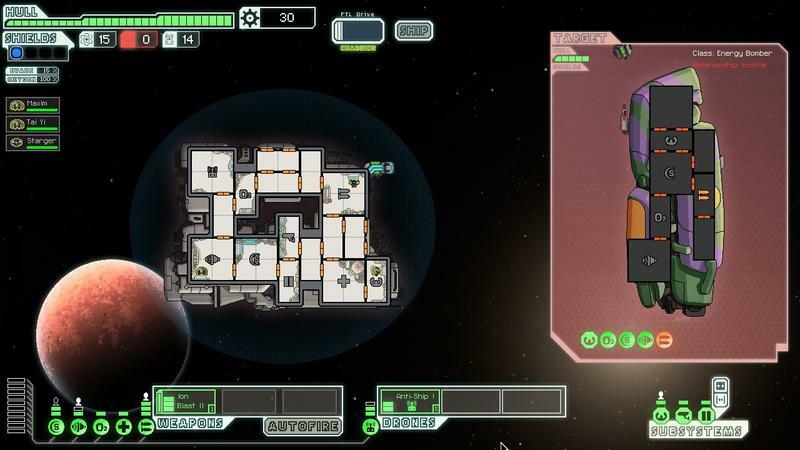 The first time I entered space in FTL: Faster Than Light, my entire crew was dead in a matter of minutes. This game also packs a really, really good soundtrack. It comes thanks to the work of Ben Prunty. You can flip through the music using the player below. If you think you want to buy the album, it’ll run you a mere five dollars. sounds interesting, toss the 10 bucks and give it a go. Who knows, you might be as addicted to it as I am.